This weekend sees the first Provincial event on the 2018 calendar for the Laser fleets across Ireland. All roads lead West to Baltimore for the CH Marine Laser Munster Championships. They are to be held on Saturday 31st March and Sunday 1st April. There are a large number of Masters entered to compete at the event as it is one of two remaining qualifiers to get on the Irish rankings prior to the Master Worlds which are to be held in Dun Laoghaire this September. 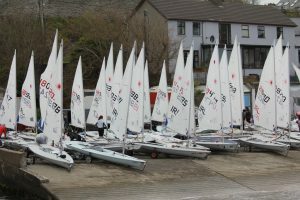 There are 106 currently entered with 36 Royal Cork sailors spread across the 4.7, Radial and Standard Fleets and across the youth right up to master categories. We wish all our sailors the very best of luck. A lot of families will be on the road again next week as the Volvo Youth Pathway National Championships 2018 are to be held in Dun Laoghaire from 5th to 8th April. The IODAI Optimist Trials are also incorporated into this Regatta. They are to be jointly hosted by the Royal St. George Yacht Club and The National Yacht Club. List of current entries can be found here. A video of last year’s Youth Pathway National Championships in Ballyholme can be found below.